Thank you for considering giving a gift to the Department of Economics. Gifts to the economics department support the pursuit of excellence and help create academic and research opportunities for students and faculty. You can donate to the program online by selecting “Other” under “Choose where you’d like to designate your gift,” and then writing in “Department of Economics” in the field via this secure online form. 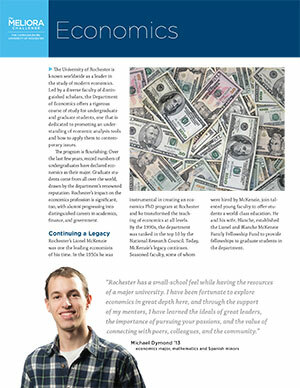 Learn more about what your gift means to the department through our flier (PDF).